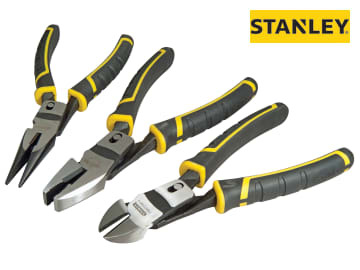 3 piece Stanley FatMax® Compound Action Pliers Set with dual pivot, giving 70% more cutting and gripping power than regular action pliers. They have bi-material handles and hardened steel jaws. 1 x FatMax® Compound Action Combination Pliers 215mm. 1 x FatMax® Compound Action Side Cutting Pliers 200mm. 1 x FatMax® Compound Action Long Nose Pliers 200mm.